We were welcomed by a warm & cozy home with large beautiful windows & wooden floors. The accommodations were comfortable & clean and our expectations from the Airbnb description were met, if not exceeded. 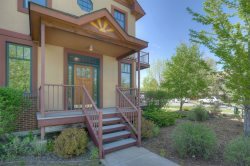 The house location was perfect for us since it was 4 blocks from Durango's Main Street and a short jaunt to historic downtown attractions, shops, amazing restaurants & pubs. Although The Green House is a newer, energy efficient home, it has a retro feel due to the care taken in using antique doors & decorative window panes. We thought it was a nice added touch! The kitchen appliances were easy to use & of good quality, and the cabinets & storage were well organized. The neighborhood was charming & we felt very safe there. The Green House was a great place to stay, and made our Durango trip that much more memorable. We will be back! The condo was very spacious and comfortable for all 14 guests! The location for ski in ski out was very convenient! We loved our stay! I have stayed in many VRBO properties. The VRBO website describes the house accurately but you can't accurately describe the awesome location. The home is located in one of the most beautiful areas of the Colorado. The Architect did a great job capturing the views out of every window in the house. The house is well stocked with everything you need and the hot tub was an extra bonus. We liked it so much we extended our stay!!!! I will definitely go back to and would highly recommend this property. The house was beautiful and the owner was extremely gracious and courteous! The views are gorgeous and the house was very comfortable and well-stocked. We had everything we needed. We would definitely stay here again. Thank you for a great vacation! Everything was wonderful and worked out great! The house is beautiful and well stocked. We thoroughly enjoyed ourselves. Marie and Suzanne were great, responsive, and helpful. They are fantastic assets to your team. The Lake View House was a beautiful, cozy home and we were so thankful to be able to spend our Christmas together in it. My brother-in-law is already planning next year's visit! I loved Durango and when the water went out at the condo we rented Marie found us a new place to say within 30 mins and did not make us pay a difference at all. Really appreciate all the work she went through to make sure we had a hassle free vacation!! The person you deal with once you've completed the transaction was helpful and answered my emails very quickly. Definite kudos for this. We had a wonderful time! The Condo is roomy for it being a one bedroom. It has one bathroom but an additional sink in the bedroom, which was really nice. They had a coffee pot, crock pot, plenty of dishes and a dishwasher, which made life so much easier! Marie was so helpful from the beginning to the very end. She answered all of my emails and even sent me maps and lists of helpful tips. Even during our stay i emailed her about the fan remote and some extra fire starters. She had both there the next morning hanging on our door. The lockers are wonderful and held all of our skiis. The condo was a 5 min walk to the lifts and Purgy's. Lots of great things for the kids to do and a great beginner ski area. This is a wonderful family ski community. We loved staying here, it was an amazing Spring Break and we will be back next year! !